When it comes to setting up an RC car, the shocks have an enormous effect on the handling and control. Most racers would agree that the tires have the biggest effect on traction, second, the shocks, then all other car settings. If you think about it, the little patch of tire touching the ground is all the car has for traction. So it is critical you have the right tire for the conditions and tune your shocks to keep that tire on the ground as much as possible. The other car settings are used to keep the tire contact surface as flat to the surface as possible during the suspension travel. The bottom line is have as much rubber on the ground at all times and to keep the car rubber side down. This might sound easy but after spending a lot of time, you will discover that there is no perfect setup. There is only compromise and balance. As you move from high to low traction conditions or smooth to rough conditions everything has an effect on each another. I suggest you try to set your car up for the conditions you expect you will encounter during the main event. Often, those conditions are hard to anticipate because it takes a race to create those conditions. That's why people who race all the time do so well. Because they have seen how tracks develop during a race with hundreds of laps, they can predict what the conditions will be and preset their car to be optimal for those conditions. Often, they run a different setup in qualifying than they run in the main event. I believe this is where the TQ curse comes from. Often, the top qualifier (TQ) has his car setup perfect for qualifying and it ran so good, he does not want to change it for the main event. But you can bet the conditions will be different in the main and someone else's car will work better in those conditions. There is also something to be said for those who take a neutral setup approach. Find something in the middle and run it all the time so you know how your car is going to react. I believe this is the best approach for beginners to intermediate drivers or those who just what to have fun driving and do not want to chase setups. Unfortunately, I was always trying to find that "perfect" setup and the tire and shock oil manufactures loved me for it $$$$. So, I'm here to share some of what I learned to save you some time and $$$$. There are three main tuning components to an RC car shock: the spring, piston, and oil. They are all three equally important and directly affect each other. Additionally, the shock position will simultaneously affect the performance of all three of these main components. The spring is fairly straight forward. They range from soft to hard. You should focus on selecting a spring for the weight of your car. Springs are usually designed to be either linear or progressive. Also, the length of the spring has an effect. A shorter linear spring will have more of a progressive effect. Progressive springs tend to work better on smooth high traction tracks. Linear tend to work better on rough low traction tracks. I have seen racers put front springs on the rear of the car on high traction tracks to get more of a progressive feeling spring on the rear. I think linear springs are better because they are easier to tune. A lot of beginners read too much into selecting a spring and not enough into the piston and oil. = Use softer RC car springs in rough, low traction conditions. = Use harder RC car springs in smooth, high traction conditions. = Short RC car springs are more progressive. = Long RC car springs are more linear. The shock pistons main function is dampening. Shock pistons greatly affect the compression and rebound shock stroke. Shock pistons come in all different hole numbers and sizes. Also, there are many shock pistons designed to let oil flow easier one direction vs the other. 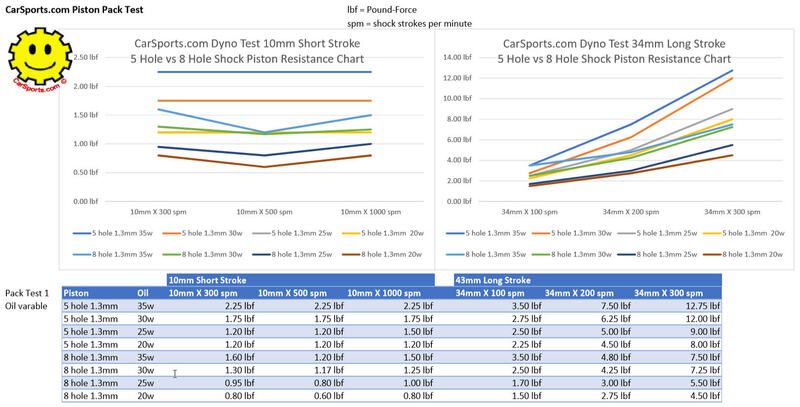 Five hole shock pistons would have more overall resistance than an eight hole shock piston. Typically, you would use a lower 5 hole (More high speed compression resistance) shock pistons on smother, higher traction tracks. Use higher 8 hole (lower high speed compression resistance) shock pistons on rough, low traction tracks. Believe it or not, because of the of the sidewall surface area of the holes, the 5 hole and the 8 hole have almost the same (slow speed compression) for the same hole size. This slow speed resistance effect comes from the oil friction resistance of the surface area around the holes. For example, in a 5 hole 1.3mm and a 8 hole 1.3mm shock piston would have almost the same "Slow speed compression resistance", but 5 hole 1.3mm piston will have more "High speed resistance" on major jumps and the 8 hole 1.3mm piston will have less "High speed compression resistance" on major jumps. Most people refer to "Pack" as the initial resistance of movement in the stroke. But I have quit using the term "Pack" because it is too vague. Instead I have started using the motocross suspension terms of slow speed and high speed compression. If you could only buy one piston set for an 1/8 scale car, I would recommend our 6 hole valve pistons with 10% rebound washer. You can always put the 0% washer in and it would be the same as the standard 6 hole piston. I typically run 6 hole 1.3 in the front and 6 hole 1.3 in the rear. = 8 hole pistons - Use pistons with more holes in rough, low traction conditions. = 5 hole pistons - Use pistons with fewer holes in smooth, high traction conditions, large jumps. The oil provides a consistent dampening resistance force. Temperature is the biggest thing to take note of with oil. Oils have gotten better over the years. Make sure you use a good synthetic oil because the viscosity changes less with the temperature. Associated, Kyosho, Losi, Mugen, Xray and many others all have good synthetic shock oil. It takes about 10-15degF before you will start to notice the viscosity change. I generally change 5w oil for every 10degF. For some reason, I seem to like the feel of oil in my car from 25w to 50w range. When I get out of this range, it doesn’t seem to be as consistent. Use thinner oil when the track is rough and low traction conditions. Use thicker oil when the track is smother and high traction conditions. = Use thinner oil in rough, low traction conditions. = Use thicker oil in smooth, high traction conditions. The shock position changes how progressive the shock is in the travel of the suspension. If the shocks are more vertical, they go from soft to hard in a more linear transition. If the shocks are laid down more, the shocks will have a more progressive transition from soft to hard. Lay the shock over more when the track is rough and low traction conditions. Stand the shocks more up straight when the track is smother and in high traction conditions. = lay-down for rough, low traction conditions. This gives you a slower responding car, but is more forgiving to drive. = Straighten up for smother, high traction conditions. This gives you a quicker responding car, but less forgiving to drive. First, select a spring that is good for the weight of your RC car. Second, select a piston with the right pack for your race conditions. Third, select the position for your race conditions. Forth, select the right RC shock oil for the temperature of your race conditions. It's always best to start with a setup sheet from a reliable RC PRO that runs the same RC car you do. Only make one change at a time to your RC car before running it. This way you can easily tell what changes help or hurt the handling of your car. Remember everything is a compromise with a car suspension and tune the car to what will give you the biggest advantage on the most parts of the RC track.